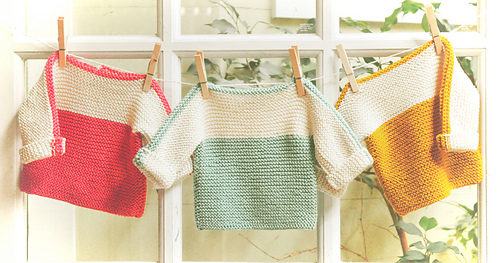 These cute little French Macaroon sweaters (or Macaron in French) are knit in a simple garter stitch. The sweater has a boatneck neckline, with a one button closure in the back to allow easy dressing. Each side is knit in one piece, and a three needle bind off is used to secure the shoulders to each other. Two little seams on each side finish up the sweaters.They knit up in no time, and like the delicious sweets they are named after, you might not be able to stop at just one!